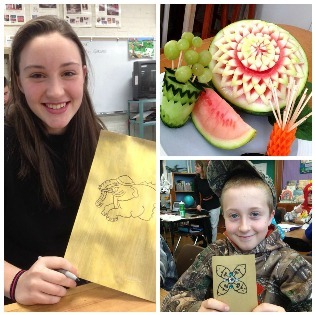 Students practicing drawing Thai mystical animals, fruit carving, and Thai lotus flowers. In his homeroom in Thailand, Mr. Supanya Khienjarern engages 60 middle school students in social studies lesson plans each day using Flip Classroom Multimedia and students in all grades with the annual school-wide Social Studies Competitions. His success with engaging students in learning at Bangkok Christian College, a school of 5000 students, promoted the College of Education and Social Services to invite Mr. Khienjarern as a Visiting Scholar for the Spring Semester at UVM. In addition to visiting local schools with faculty members to observe student teaching and joining Educational classes to learn about teaching strategies in Vermont, Mr. Khienjarern (or Lek, as he is known by his friends and colleagues) has been visiting local schools to share aspects of Thai culture. Since arriving in January, Lek has visited Enosburg Falls Middle School where he introduced students to Muay Thai boxing, Mater Christi where he taught classic Thai Fruit carving to a grade eight classroom, Thai art with classes at BFA-Fairfax Middle and High School, and Thai language classes at Edmunds Middle School. In the following months, Lek will be visiting CP Smith, Morrisville Middle School, and Bakersfield Elementary School to teach traditional Thai games, Thai culture, and Thai language. "This has been a great experience for the students," commented Enosburg Falls Middle School principal Mike McRaith. "Seeing the students make a friend with someone from so far away has been the best part." As most teachers who arrive to school on the first day of a new year, Lek arrived in Vermont suitcases filled with teaching materials and lesson plans for helping students K-12 learn about Thailand. In the following weeks Lek will be visiting schools in Morrisville before returning to the Burlington area to work with UVM faculty on Flip classroom strategies in both Thailand and the US. For more information on the Visiting Scholar program at UVM and how to host a Visiting Scholar in your classroom, please contact the Asian Studies Outreach Program coordinator Jacqueline Drouin at Jdrouin@uvm.edu.